Probably one of the hardest things I’ve done so far on this site was reading through all of these and determining the winners. You all have some fantastic ideas. We wish everyone could win. Brett Henderson and Banjo_Lips! Both had great ideas and we wish them the best. Good luck to both of you and thank you everyone who entered! Our publishing buddies over at Wiley just released a new book that should interest those looking to enter the Android application game. 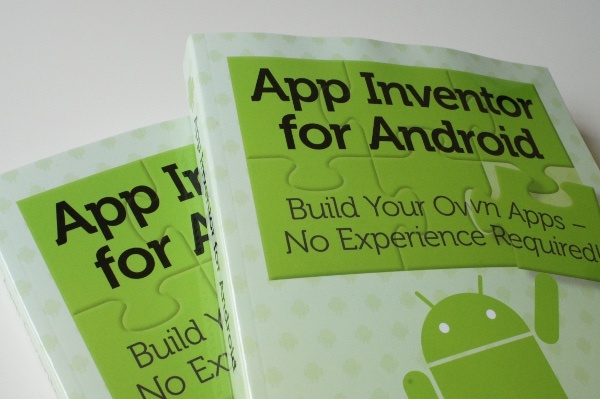 The book is called “App Inventor for Android: Build Your Own Apps – No Experience Required!” and is a complete guide on how to get up and running and pumping out apps with Google’s App Inventor in no time. The book takes you through the simple setup process and then proceeds to teach you how create 8 different apps including one for Twitter. There are pictures, step-by-step guides, and even instructions for getting adb setup which is something I know that many of you have struggled with. Most importantly though, we have 2 copies to give away to those aspiring to be the next big developer. 2. We’ll pick a winner in 2 hours at 4:15PM Pacific. And if you don’t happen to win, they wanted to make sure we passed on discount information for those who would still be interested in purchasing the book. From now until June 18, you can hit up the Wiley site and enter code ANDRD to receive 40% off. Not a bad deal, right there.